A Spell for Capricorn attraction. This Capricorn Spell that works with the Law of Attraction and the power of Magic is to allow you to attract someone from the Astrology Star Sign of Capricorn. If you are in love with a Capricorn man or Capricorn woman you will be aware of the personality traits associated with that Zodiac sign. But loving a Capricorn man or Capricorn woman can have its challenges and this is where having a Spell for Capricorn attraction comes in. Perhaps you know in your heart that your Capricorn lover is the one for you, but the stars seem to say you are not quite a perfect love match. You can do something to override any supposed incompatibility by having me cast this Spell for Capricorn attraction. By using the precise correspondences, energies and elements relating to this Zodiac sign I can cast a powerful Spell to get amazing results. You can ask me to cast your Spell at anytime and do not need to wait until the Capricorn phase. This Capricorn Spell is ideal if you are or want to be romantically involved with someone who is a Capricorn and born during the time period of 22 December to January 19 . If your heart's desire is a Capricorn man or Capricorn woman and you want to attract, keep, reunite with or commit to them, then this is the perfect Spell for you. I can cast this Spell as soon as possible. Very powerful and specific energies relating to the star sign of Capricorn are used in the Spell casting process. This enables a powerful message and intention to reach your heart's desire. For example, Krystina from New Jersey, USA wanted her Capricorn man to return to her after he broke off their engagement. She asked me to cast a Spell so that they could get back together and love one another together, faithfully. She also wanted the bond between them to be stronger and unbreakable. Shortly after Spell casting I was pleased to hear that they were now back together and going ahead with the wedding they had planned. In Love with a Capricorn Man? To seduce a Capricorn man you'll need to show how responsible, mature and reliable you are. Capricorn men are not attracted to wild, flashy or crazy women. Slow, steady and stable is the mantra of the Capricorn man and you will need to display these traits to him before he can have any interest in you. You'll need to get your Capricorn man to trust and respect you as a friend first before he could think of making romantic advances towards you. Capricorn men can be quite suspicious and distrustful and would need to really get to know a women well before entrusting her with his heart. Romantic gestures, emotional displays and outpouring of feeling are alien to most Capricorn men. So don't expect him to sweep you off your feet. You may have to do most of the running in this relationship but don't be too pushy as this will turn him off you. In Love with a Capricorn Woman? 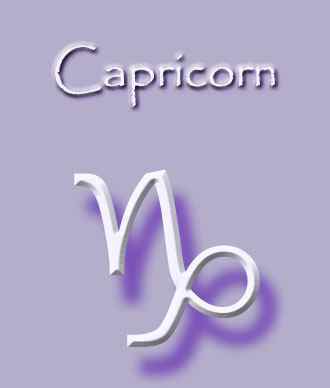 Capricorn women are very conventional and traditional and will expect to be treated like a lady at all times. Capricorn women do not like weird or wacky experiences so you will need to keep dates to the tried and tested predictable pattern of movies and dinner. Again nothing too flashy or flamboyant –films will need to be mainstream and restaurants unpretentious. Capricorn women take a lot of time and effort to really get to know them. Take things slowly, patiently and steadily and you will be rewarded with the pleasure of a loving, loyal and wonderful woman. To break through the rather serous side of a Capricorn women keep conservation light hearted, fun and witty. Capricorn women tend to dwell in gloomy places so always try to inject some laughter into the relationship. Fear of the future, feeling lonely or unloved and powerless are all negative emotions associated with a lack of true, faithful, committed love. These negative emotions will seep into your Aura causing dark and negative energies to surround you. And as the Law of Attraction states 'like attracts like', so you are very unlikely to attract, keep or reunite with a true love without help. Having me cast a Spell will dispel the negative energies surrounding you and replace them with only positive energies that are very attracting. You will be sending out the powerful message that you want to love and be loved. Having a pure white magic Spell cast will automatically cleanse your Aura. A clear, bright and glowing Aura is essential in living a successful, fulfilling and happy life and is very attracting. Having me cast a powerful love Spell will dispel the negative energies surrounding you and replace them with only positive energies that are very attracting. In this way you will be sending out the message to the Universe that you are open to receiving love. You will be sending out the powerful message that you want a joyful life filled with love and light and immense happiness. Capricorn Spells that work with the Law of Attraction are known to be very powerful and effective. Your personal and individual Capricorn Spell will be formulated, personalised and expertly cast by me using the relevant and appropriate ingredients to aid speedy manifestation. I personally guarantee that I will give a 100% effort using all my expertise and experience and do my utmost to cast a successful Spell to get the real results you want, with harm to none. In all my Capricorn Spells, alongside the usual ingredients I use in my Spell casting rituals, I use Carnation essential oil to anoint indigo candles with which align with the star sign Capricorn. Your Spell will be cast in love and light, with harm to none and abiding by the Law of Attraction. It cannot backfire and does not bend the will of anyone. The moment I cast a Spell for you it immediately begins working on your request!